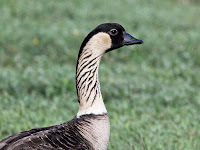 When Goose Island Brewpubs announced "The Quest for the Imperial Goose" homebrew competition last October I couldn't help but be intrigued. The charge was to brew a Russian Imperial Stout, per BJCP Guidelines and submit for a chance to win a day brewing with the Pub Brewmaster as well as have your recipe on tap at Goose Island Brewpubs. By no means would I expect to win, since I had never brewed this style before - but knowing that I work well under pressure I decided to sign up and accept the challenge. If nothing else it would be a great learning experience that would hopefully result in some helpful feedback. The Russian Imperial Stout is a huge beer, with a complex grain build. Per the guidelines the beer had to be brewed subsequent to Nov 1st, 2012 which left just enough time for fermentation and bottle conditioning (according to the general beer fermentation schedule), knowing that it would still be a very "young" beer at this stage for the style. I had the pleasure of working with Larry from Brew & Grow to craft a rich recipe using some beautiful crystal, chocolate and specialty German malts as well as some roasted barley and wheat. I had been holding on to a lovely bag of 100% Kona coffee beans brought back from Hawaii, waiting for the right opportunity to incorporate it into a recipe and this seemed to be the perfect occasion. Harvested in tropical conditions and volcanic soil, pure Kona is deemed to be one of the highest quality coffees. With hints of chocolate and just enough fruit and acidity to round out the flavor it sounded like the perfect compliment to my RIS. Upon further research of exactly how and at what stage to add the coffee I decided on a cold extraction approach I found in a really helpful blog post by Brian Cendrowski (of Untamed Beer) called How To Put Coffee In A Coffee Stout. Per Brian's suggestion I coarsely ground 8oz of my Kona beans and soaked in 24oz of cold sanitized water for three days. I then filtered the coffee and added 2 cups to the secondary fermenter, adding gradually and tasting to see how much impact it had on the flavor. When I started thinking about the label the idea of using burlap fabric instantly became the perfect tie in to coffee. I was able to cut strips of burlap to be used a full wrap label. 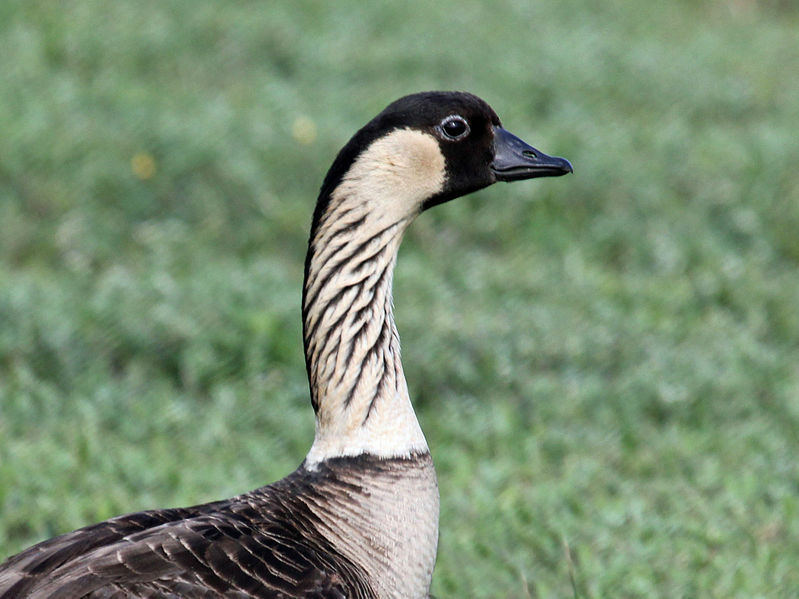 As it turns out "goose" in the Hawaiian language (Nēnē) represents a species exclusive to the islands and is the official state bird - suddenly the plan was coming full circle. 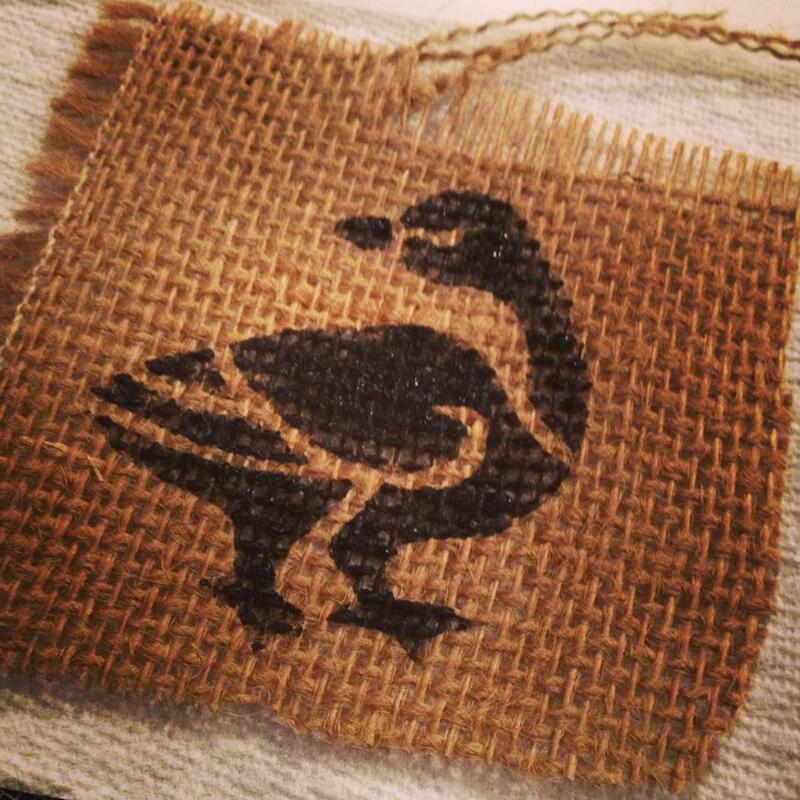 I illustrated a tiki/totem style goose that I turned into a custom stencil and painted onto the burlap fabric.